Taos Pueblo is the only living Native American community designated both a World Heritage Site by the United Nations Educational, Scientific and Cultural Organization (UNESCO) and a US National Historic Landmark. The multi-storied adobe buildings are more than 1,000 years old and are considered to be the oldest continuously inhabited communities in the United States. 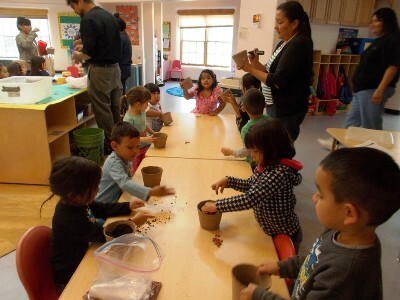 Taos Pueblo Head Start (TPHS) is learning more about healthy eating by gardening, trying new foods and participating in family style dining. The organic indoor garden at TPHS is entirely maintained by students, teachers and parents. The creation of the garden was inspired and supported by the USDA Classroom Kit Grow It, Try It, Like It. A parent volunteer created the indoor garden. Another parent taught the children about the relationship between bees and flowers in a unique way—by bringing in dead bees tied to Popsicle sticks. The children pollinated bean flowers using pollen from bee hairs. Today the garden has ripening tomatoes, corn, beans, beets, carrots and herbs. “Our garden teaches children about where food comes from, the necessity to be good stewards of living plants and animals, and the effort needed to produce healthy food for our bodies,” explains Nutrition Coordinator Yvonne Valdez. At each meal fresh fruits and vegetables are offered to all students. Students are encouraged to try new vegetables every day and chart their experiences on a CACFP “I tried it, I liked it” reward chart. For the past several years, all meals have been served family-style which help children understand roles and responsibilities of serving themselves appropriate portions and cleaning up after themselves. Being able to serve themselves promotes the children’s motor skills and hand-eye coordination as well. The Taos Pueblo Head Start Program (TPHS) has received training from New Mexico Healthy Kids Healthy Childcare (New Mexico-tailored LMCC initiative) to learn more about obesity prevention efforts to help their community. Miramar United Methodist Preschool wanted to be healthier and increase nutritional education. They received assistance, new classroom materials and held an Open House to engage families. Find information on the basics of farm to preschool, getting started with farm to preschool, and information on local food procurement for child care centers and family child care.